In this post, we'll talk about the method for explaining the predictions of any classifier described in this paper, and implemented in this open source package. Motivation: why do we want to understand predictions? Machine learning is a buzzword these days. With computers beating professionals in games like Go, many people have started asking if machines would also make for better drivers, or even doctors. Many of the state of the art machine learning models are functionally black boxes, as it is nearly impossible to get a feeling for its inner workings. This brings us to a question of trust: do I trust that a certain prediction from the model is correct? Or do I even trust that the model is making reasonable predictions in general? While the stakes are low in a Go game, they are much higher if a computer is replacing my doctor, or deciding if I am a suspect of terrorism (Person of Interest, anyone?). Perhaps more commonly, if a company is replacing some system with one based on machine learning, it has to trust that the machine learning model will behave reasonably well. It seems intuitive that explaining the rationale behind individual predictions would make us better positioned to trust or mistrust the prediction, or the classifier as a whole. Even if we can't necessarily understand how the model behaves on all cases, it may be possible (and indeed it is in most cases) to understand how it behaves in particular cases. Finally, a word on accuracy. If you have had experience with machine learning, I bet you are thinking something along the lines of: "of course I know my model is going to perform well in the real world, I have really high cross validation accuracy! Why do I need to understand it's predictions when I know it gets it right 99% of the time?". As anyone who has used machine learning in the real world (not only in a static dataset) can attest, accuracy on cross validation can be very misleading. Sometimes data that shouldn't be available leaks into the training data accidentaly. Sometimes the way you gather data introduces correlations that will not exist in the real world, which the model exploits. Many other tricky problems can give us a false understanding of performance, even in doing A/B tests. I am not saying you shouldn't measure accuracy, but simply that it should not be your only metric for assessing trust. Lime: A couple of examples. Can you really trust your 20 newsgroups classifier? First, we give an example from text classification. The famous 20 newsgroups dataset is a benchmark in the field, and has been used to compare different models in several papers. We take two classes that are suposedly harder to distinguish, due to the fact that they share many words: Christianity and Atheism. Training a random forest with 500 trees, we get a test set accuracy of 92.4%, which is surprisingly high. If accuracy was our only measure of trust, we would definitely trust this algorithm. Below is an explanation for an arbitrary instance in the test set, generated using the lime package. This is a case where the classifier predicts the instance correctly, but for the wrong reasons. A little further exploration shows us that the word "Posting" (part of the email header) appears in 21.6% of the examples in the training set, only two times in the class 'Christianity'. This is repeated on the test set, where it appears in almost 20% of the examples, only twice in 'Christianity'. This kind of quirk in the dataset makes the problem much easier than it is in the real world, where this classifier would not be able to distinguish between christianity and atheism documents. This is hard to see just by looking at accuracy or raw data, but easy once explanations are provided. Such insights become common once you understand what models are actually doing, leading to models that generalize much better. Note further how interpretable the explanations are: they correspond to a very sparse linear model (with only 6 features). Even though the underlying classifier is a complicated random forest, in the neighborhood of this example it behaves roughly as a linear model. Sure enough, if we remove the words "Host" and "NNTP" from the example, the "atheism" prediction probability becomes close to 0.57 - 0.14 - 0.12 = 0.31. Below is an image from our paper, where we explain Google's Inception neural network on some arbitary images. In this case, we keep as explanations the parts of the image that are most positive towards a certain class. In this case, the classifier predicts Electric Guitar even though the image contains an acoustic guitar. The explanation reveals why it would confuse the two: the fretboard is very similar. Getting explanations for image classifiers is something that is not yet available in the lime package, but we are working on it. Lime is short for Local Interpretable Model-Agnostic Explanations. Each part of the name reflects something that we desire in explanations. Local refers to local fidelity - i.e., we want the explanation to really reflect the behaviour of the classifier "around" the instance being predicted. This explanation is useless unless it is interpretable - that is, unless a human can make sense of it. Lime is able to explain any model without needing to 'peak' into it, so it is model-agnostic. We now give a high level overview of how lime works. For more details, check out our paper. First, a word about interpretability. Some classifiers use representations that are not intuitive to users at all (e.g. word embeddings). Lime explains those classifiers in terms of interpretable representations (words), even if that is not the representation actually used by the classifier. Further, lime takes human limitations into account: i.e. the explanations are not too long. Right now, our package supports explanations that are sparse linear models (as presented before), although we are working on other representations. In order to be model-agnostic, lime can't peak into the model. In order to figure out what parts of the interpretable input are contributing to the prediction, we perturb the input around its neighborhood and see how the model's predictions behave. We then weight these perturbed data points by their proximity to the original example, and learn an interpretable model on those and the associated predictions. For example, if we are trying to explain the prediction for the sentence "I hate this movie", we will perturb the sentence and get predictions on sentences such as "I hate movie", "I this movie", "I movie", "I hate", etc. Even if the original classifier takes many more words into account globally, it is reasonable to expect that around this example only the word "hate" will be relevant. Note that if the classifier uses some uninterpretable representation such as word embeddings, this still works: we just represent the perturbed sentences with word embeddings, and the explanation will still be in terms of words such as "hate" or "movie". An illustration of this process is given below. The original model's decision function is represented by the blue/pink background, and is clearly nonlinear. The bright red cross is the instance being explained (let's call it X). We sample perturbed instances around X, and weight them according to their proximity to X (weight here is represented by size). We get original model's prediction on these perturbed instances, and then learn a linear model (dashed line) that approximates the model well in the vicinity of X. Note that the explanation in this case is not faithful globally, but it is faithful locally around X.
I hope I've convinced you that understanding individual predictions from classifiers is an important problem. Having explanations lets you make an informed decision about how much you trust the prediction or the model as a whole, and provides insights that can be used to improve the model. If you're interested in going more in-depth into how lime works, and the kinds of experiments we did to validate the usefulness of such explanations, here is a link to pre-print paper. The package is very easy to use. 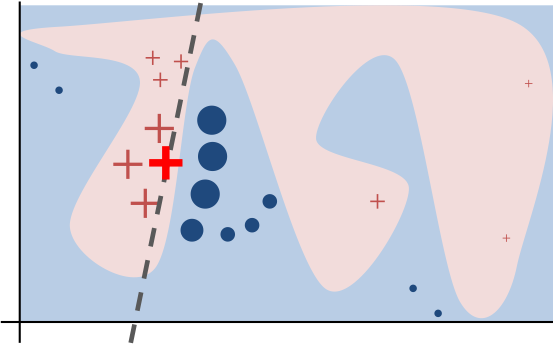 It is particulary easy to explain scikit-learn classifiers. In the github page we also link to a few tutorials, such as this one, with examples from scikit-learn.